Rangjung Pemé Nyingtik (Tib. རང་བྱུང་པདྨའི་སྙིང་ཐིག་, Wyl. rang byung pad+ma'i snying thig), the 'Heart Essence of the Self-Born Lotus' — a mind terma of Kyabje Dilgo Khyentse Rinpoche, a practice of the Three Roots. This was first revealed in Tibet when Khyentse Rinpoche was with Jamyang Khyentse Chökyi Lodrö. The revelation was kept secret and the texts were left at Mindroling monastery and later lost. Years later in exile in Nepal, Trulshik Rinpoche heard about this practice as he was receiving the oral transmission for the Kangyur from Khyentse Rinpoche and he requested Khyentse Rinpoche to reveal it again. They went to Yangleshö and after seven days of practice, Khyentse Rinpoche revealed the practice for a second time. Later, when a copy of the original text, which had been found in Tibet, was brought to Nepal it was found to be identical. The visualization is as follows: One visualizes oneself as Hayagriva in union with Vajravarahi. 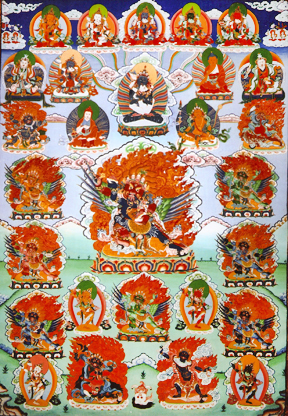 At one's forehead is Pema Tötreng Tsal and the eight vidyadharas. At one's heart centre is Chemchok Heruka. At the navel is Vajravarahi and at the secret centre, Ekadzati. Kyabje Dilgo Khyentse Rinpoche, Prapoutel, France, 25 August 1990. Kyabje Trulshik Rinpoche, Lerab Ling, France, 25 June 2003. Khyentse Yangsi Rinpoche, Lerab Ling, France, 19 July 2010. ↑ When Jamyang Khyentse Chökyi Lodrö was offered the empowerment and instructions for this practice by Dilgo Khyentse Rinpoche, he declared, "Both the words and meaning of your mind treasures are incomparable nowadays." See, Dilgo Khyentse, Brilliant Moon (Boston & London: Shambhala, 2008), page 104. This page was last edited on 15 July 2016, at 10:12.